Did My Prayer Prevent My Success? We arrived at the stadium in the middle of a large field. It felt hotter than a typical Mississippi day in this small Texan town. The wind roared at 20 miles per hour—the air dry as a desert. Tumbleweed rolled across the dirt and the red oval radiated heat. I would run 25 laps with no shade and no water, but a medal for the first one who finished. I, a senior and the fastest in the field, stood confident as I prepared myself with stretches and got my uniform ready. But my forehead beamed drops of sweat and my feet began to suffocate in my hot pink Nike flats. The gun went off. For the first lap, I checked my watch every 100 meters to see if I paced well. Then, I would coast to victory for the next 24 laps—so I thought. The second lap, however, became the last lap I would remember as I underwent a heat stroke mid run. I somehow finished the race but ended up on the athletic trainer’s table after being carried off by teammates. My heart beat so fast I had trouble breathing. My eyes shut and I had no strength to open them. I couldn’t squeeze the trainer’s hand. I couldn’t speak. I couldn’t move. But I could hear them and the panic behind their voice. God, is this it? Am I about to see you? I didn’t know if I would make it. When they shut the door to the ambulance, they also shut the door to my collegiate running career. As a Christian, who strove to run to the glory of God, it proved easy to point fingers at him and his sovereignty for allowing such a misfortune. I worked hard and gave him credit along the way. God, why are you doing this? Did God Give Me What I Prayed For? Like every morning of a race, that day I had meditated on Hebrews 12. Fixing my eyes on Christ, who knew the joy set before him and willingly suffered, motivated me to push through pain in races and get to the finish line. I didn’t know that day that in a few hours I would suffer more than ever before. And by God’s hand, that became my prayer that morning. Lord, I want to be content in you. I don’t need a medal to fulfill my life. All I need is you. Lord Jesus, help me to desire you more than anything in this world. Just give me you, and I’ll be full. In the hours following the accident, thoughts had come and gone of what I could’ve done differently to prevent my accident. I should’ve eaten more. I should’ve found shade. I should’ve gotten more electrolytes into my system. Shock at the reality that everything ended so quickly kept me awake at night. Nothing turned out how I envisioned it. Pride, in how I deserved to win, showed evident in conversations. Worry over never running again invaded my thoughts. The heat stroke had erased my memory of my prayer the day before, but when I opened my journal the next day to find the very words scribbled down, I realized it came true. 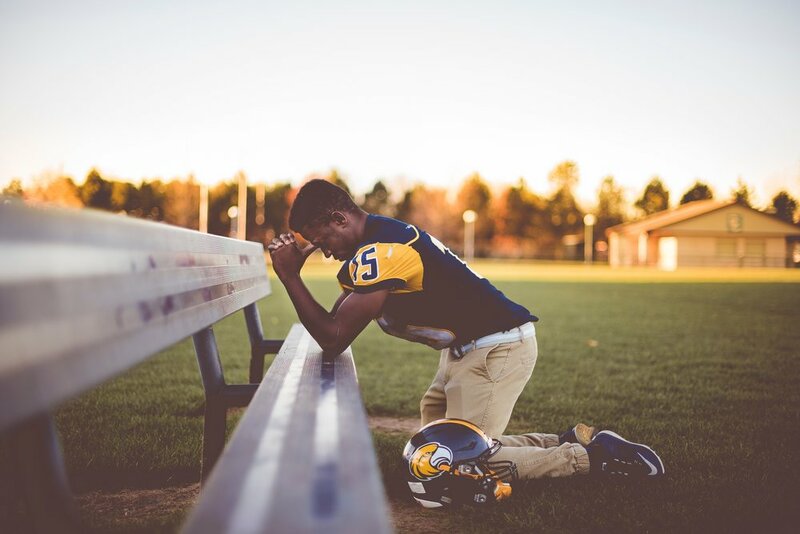 Did God cause the end of my running career because of what I prayed? Should I regret praying such a thing when it prevented my success and caused me great pain? Did my prayer almost kill me? Perhaps God puts specific things on his children’s hearts to lift to him in prayer. He fully knows the outcome of his will, but he desires a relationship with his people. Thus, he stirs hearts to pray for his kingdom to come and his will be done. Was it God’s will for me to have this accident? I don’t know. But I do know that it was God’s will for me to be fully satisfied in Christ alone and not worldly accolades, which is—after all—what I prayed for. Because I prayed to desire Jesus more than winning that day, I recognized the test between my two wants. Did I want the win badly enough that not having it would wreck me? Or did I find enough satisfaction in Jesus to stand content with nothing around my neck or in my hands? God could have chosen to take my life that day. If so, I would’ve lost the race and my life, but I would’ve gained Christ to the fullest—more than I ever could here on earth (Philippians 1:21, Psalm16:11). But he did not end my earthly life that day. Rather he gave me himself. My running career ended, but I found Jesus as all-satisfying. When we hold fast to him, when we fail, or when he takes something away, he proves himself to be all that we ever need (John 6:35). Content, we stand with empty hands, glorying in what we have in Christ—which is everything.